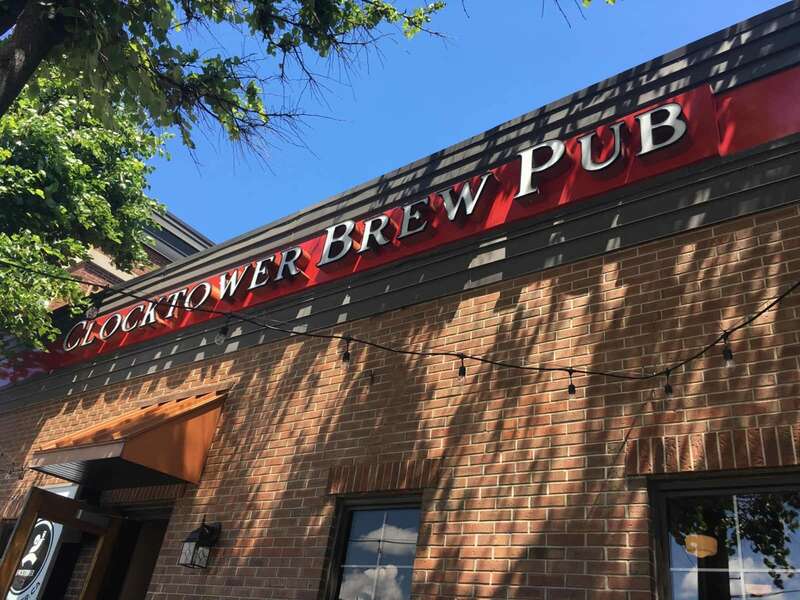 Clock Tower Brew invites you to their pub. Come relax at the bar with a drink. They are open nightly all week and are easily reachable by public transit. All served with our spicy mayo. served with raw veggies and warmed Naan bread. Warm spinach, artichoke & cheese dip, served with pumpernickel and corn tortillas. black beans, red & green onion, pickled jalapeno and as side of sour cream. Fried zucchini spears served with our own sour cream & onion dip. Our hand cut fries, topped with house gravy and cheese curds. Korean pulled chicken, green onion, cilantro & sesame seeds. One pound of our famous chicken wings, served with blue cheese dip, and tossed in your choice of the following sauces: Franks Red Hot, Mild, Medium, Hot & Honey, Malaysian, Honey Garlic, Maple BBQ, Cajun Dusted or Korean BBQ. Warm, thick cut potato chips, served with our own sour cream & onion dip. Two large soft pretzels, topped with coarse salt, served with our house sweet mustard. PEPSI, DIET PEPSI, GINGER ALE, SODA WATER, TONIC WATER, 7-UP. soup of the day, Kölsch slaw, or greens. All burgers can be substituted with a veggie patty. Cracked black peppercorns & Danish blue cheese. Banana peppers, spicy mayo and goat cheese. Bacon, fried onions, mushrooms, sharp cheddar & Swiss cheese. House made turkey patty with bacon, avocado and chipotle cranberry jam. Peameal bacon, aged cheddar & Red Ale BBQ sauce. Bibb lettuce, tomato, red onion & dill pickle. Havarti cheese & roasted red pepper on sourdough. Sharp cheddar cheese & bacon on sourdough. Fontina & capicola on herbed focaccia. Double cream brie & jalapeno on sourdough. on-wrapped meatloaf, topped with Bytown Brown mushroom gravy. Crispy chicken and stir fried vegetables, tossed in our spicy peanut sauce on chow mein noodles. Breaded chicken tenders & our hand cut fries with mustard sauce. topped with pickled vegetables, green onion and sunflower seeds. Pork can be substituted with crispy tofu. Beer battered haddock, our hand cut fries, tartar sauce & Kolsch slaw. Please see your server for todays sandwich. tofu or crispy chicken, topped with pickled carrot, daikon and fresh cilantro. Herb-roasted turkey breast, double cream brie & raspberry Dijon mayo, on sourdough bread. served on an onion bun. Please see your server for todays soup. Clocktower Red Ale beef broth, garlic croutons, topped with Swiss cheese. Baby romaine lettuce, garlic croutons, bacon, creamy Asiago dressing. and topped with candied beer nuts. tossed in honey mustard vinaigrette topped with our jerk chicken. fontina cheese, black forest ham, egg, avocado and grilled chicken. tossed in a balsamic vinaigrette. sweet corn, black beans and tossed in a creamy avocado dressing.